So simple, yet so stylish. pretty! you pull off flats so well. I'd say the tipsy shopping definitely paid off! I'm glad I'm not the only one that's had a horrible time finding shorts this summer. In a fit of frustration, I cut off some of last season's denim and chinos into shorts to get through the summer. I have the same thing with birds. That and hearts. Everyone has to have their "thing"! I love the red shoes with this outfit too. So cute! That necklace is the perfect length for your top. I love it. I totally understand how you feel. I went from black to blond (hello, six hours at the salon!) and have gradually made my way to white since then. I really do feel like a different person as a blond. Your hair looks adorable! I love this look and have found myself wearing very similar ones recently. 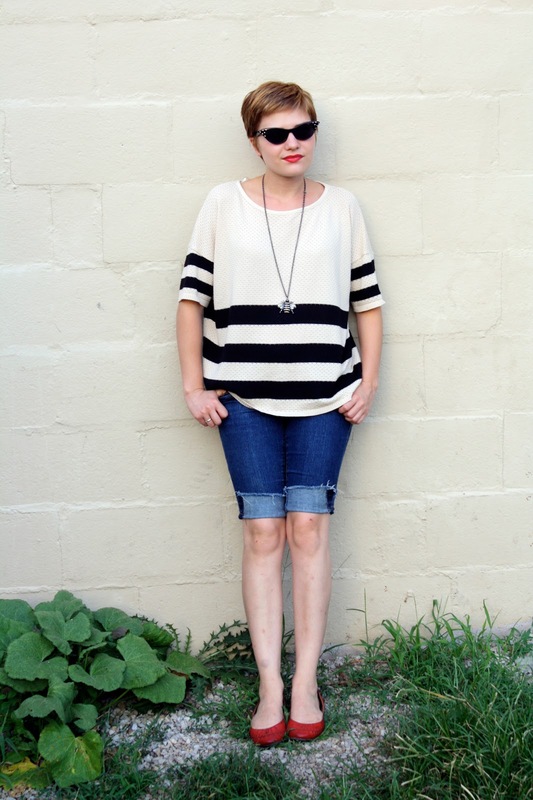 I can't get enough horizontal stripes! Ooh, oversized striped tunic? Yes please! I love this. Glad you're blond locks are so fun! I love the bee necklace! :D Animal jewelry is my favorite kind. Personally, I have a thing for octopuses (octopi?) and owls! I was shopping online and this made me think of you! That top is from F21!!? I want it, I must find it. Great look all around. Oh my goodness, I'm off to look for that necklace. I too am a bee collector. I'm actually very interested in getting a bee tattoo. Do you have pictures of yours somewhere? Super cute necklace! Nice to see someone sporting something other than an owl. And I can totally relate to your thoughts on dying your hair. I was 23 before I dyed it for the first time and since then it's been reddish, redder, red and now I went the opposite end of the spectrum to black. I wouldn't want to mess with blonde since this isn't the first I've heard of the "I want to be more blonde" phenomenon! im in love with your top. f21 should pay you cuz i'm totally heading over there to get one! tipsy shopping is a dangerous game. I love your hair! 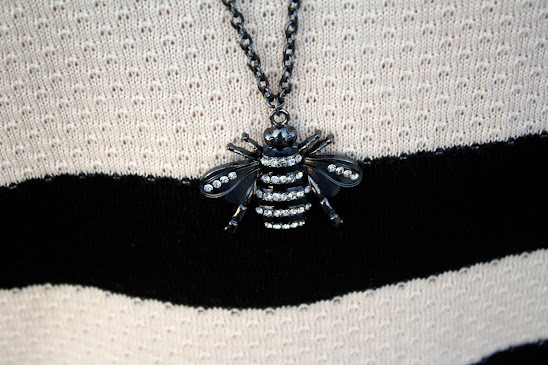 I ended up with that same bee necklace too! I ordered it in the bronz-y color but I ended up getting black. He was too cute to send back!